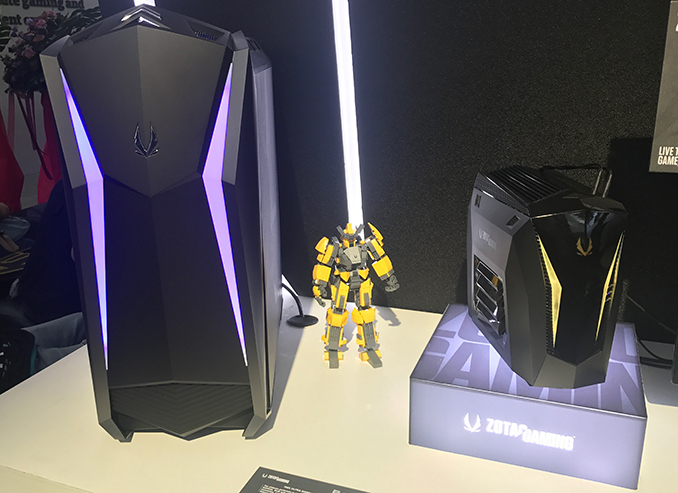 As expected, ZOTAC demonstrated its upcoming MEK Mini and MEK UItra PCs at Computex. In addition, the company published preliminary specifications of these systems. As it appears, the smaller one will be based on Intel’s six-core Coffee Lake processor, whereas the large one will be powered by Intel’s ten-core Core X CPU. 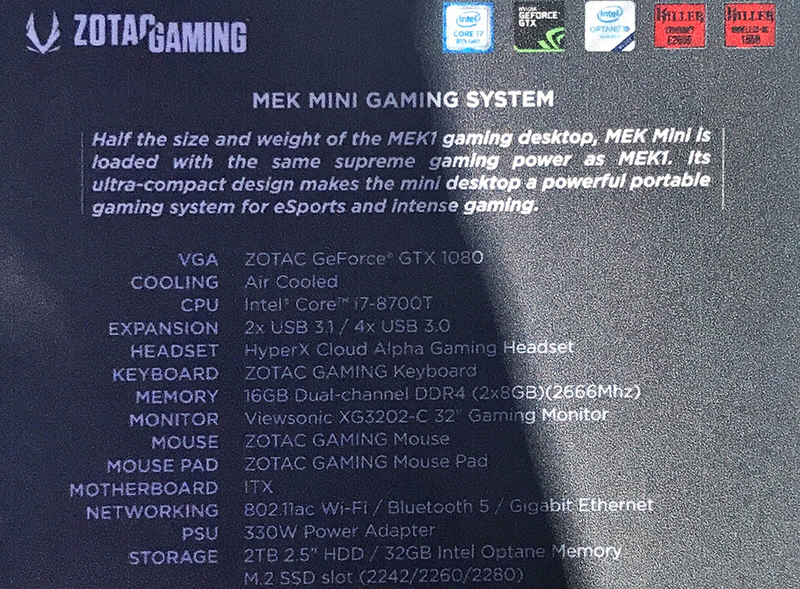 ZOTAC’s MEK Mini will be an alternative to the company’s Zbox Magnus SFF computers aimed at people who want to buy systems that work out-of-the-box rather than choosing a barebone or a system with a variable configuration. All MEK Mini PCs will use Intel’s Core i7-8700T CPU (6C/12T, 2.4-4.0 GHz, 12 MB LLC, 35 W) accompanied by 16 GB of DDR4-2666 memory, an M.2 PCIe/NVMe SSD, a 2 TB 2.5-inch HDD, and ZOTAC’s GeForce GTX 1080 Mini graphics card. 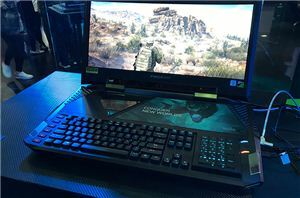 In addition, MEK Mini will be outfitted with the Killer Wireless AC 1550 and the Killer Ethernet E2500 network controllers to ensure minimal latency during gaming. 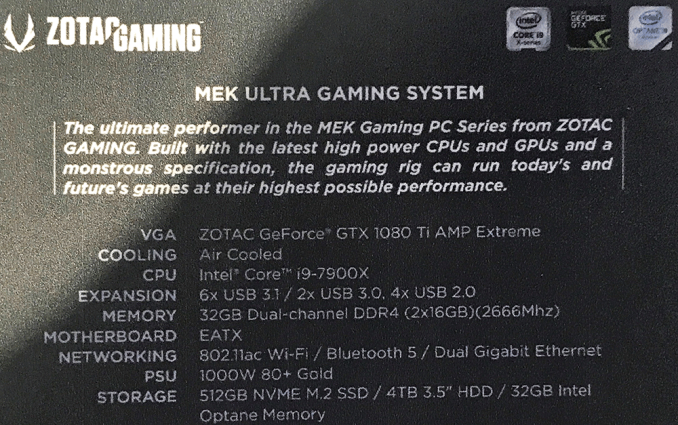 Although ZOTAC’s MEK Mini motherboard will formally feature an industry-standard Mini-ITX form-factor, the mainboard will be fully-custom and it will be impossible to swap it and upgrade the system. One of the reasons for that is external power supply and an appropriate power connector on the motherboard. 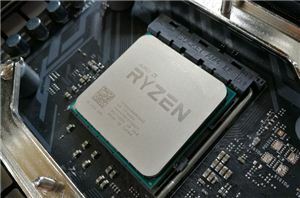 By contrast, retail platforms use standard ATX power connectors. Moving on to the bigger MEK Ultra system. 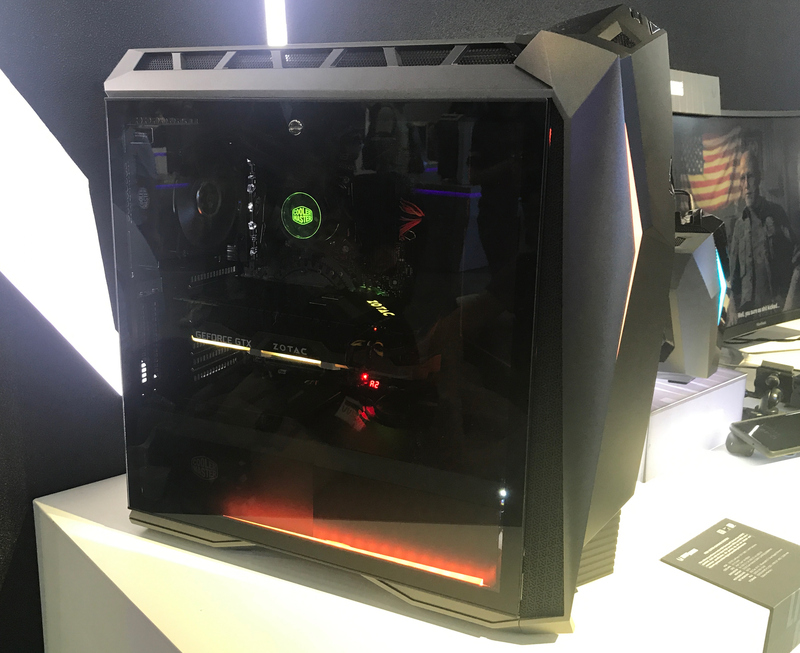 This one will be powered by a custom EATX motherboard running Intel’s X299 chipset and equipped with Intel’s Core i7-7900X processor (10C/20T, 3.3-4.5 GHz, 13.75 MB L3, 140 W) and ZOTAC’s factory-overclocked GeForce GTX 1080 Ti AMP Extreme graphics card. The system will feature 32 GB of DDR4-2666 memory, a 512 GB NVMe SSD, a 4 TB 3.5-inch HDD, and, perhaps, 32 GB Optane Memory caching SSD. As for networking connectivity, the MEK Ultra will support two GbE ports, 802.11ac Wi-Fi as well as Bluetooth 5. Unlike the smaller MEK Mini, the MEK Ultra will use off-the-shelf components, so it will be able to accommodate a new motherboard and other components. 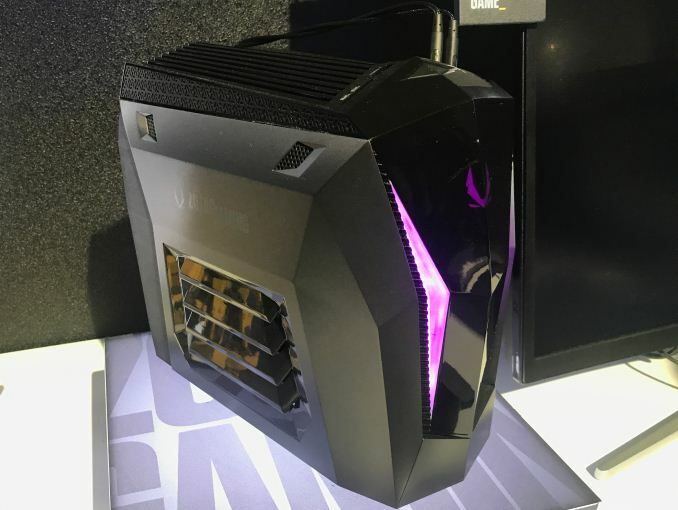 The ‘Ultra’ will be equipped with a 1000W 80Plus Gold PSU, enough to drive all the latest hardware from Intel and NVIDIA. 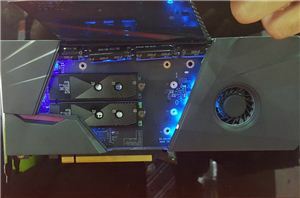 What remains to be seen is whether ZOTAC will ship its top-of-the-range gaming system with NVIDIA’s current-gen GeForce GTX 1080 Ti, or will switch to the company’s next-generation GPU that is rumoured to be available later this year. 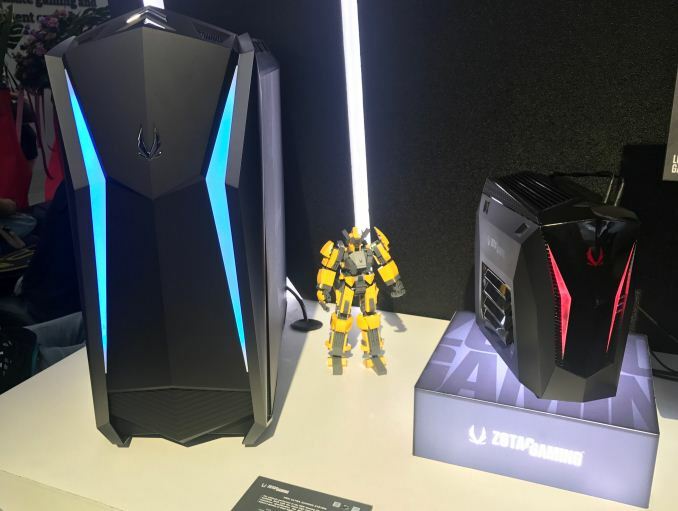 As reported, ZOTAC’s MEK Mini and MEK Ultra systems will hit the market later this year, but the final pricing will be determined at a later date. "...will be outfitted with the Killer Wireless AC 1550 and the Killer Ethernet E2500 network controllers to ensure minimal latency during gaming." Riiiiight, sure. How about some benchmarks to back that up? I mean Anandtech articles have been painting Killer products in a positive light since an announcement about Rivet Networks' return since then, but has this far not provided any benchmark numbers in support of that.